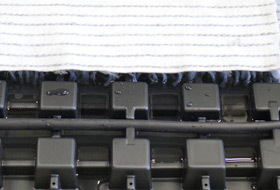 The wicking mat is covered with a layer of only about 8 cm of substrate. The plant community “summer plains” is then installed, straight “off the roll”. The basic principle: Water is fed to the Aquatec® elements through the drip lines clipped into the channels. The water is drawn upwards through the wicking mat and is available directly in the root area. If you like a flowering “summer plains”, reduce mowing frequency and nutrient supply. Or, if you prefer a hard-wearing lawn, more frequent mowing is required which will prevent the herbage from growing. You can change from one option to the other at any time. 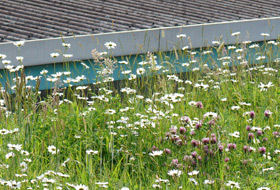 This innovative green roofing system is called “summer plains” and is in the category of simple intensive green roofs. 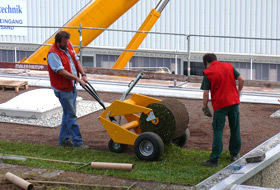 The system offers a pre-cultivated plant community “off the roll” which has been developed in conjunction with Horst Schwab GmbH, the well known specialists for roll-out lawns. The client does not have to bother about planting or finishing works on the green roof. The client has the choice of how the “summer plains” should grow and this can be changed at a later date. The choices range from having a hard-wearing lawn, if the area is to be used a lot, to a meadow character providing space for herbage growth and a larger habitat for various animal species. If you want a flowering meadow, simply reduce mowing frequency and nutrient supply. On the other hand, if you prefer to mow a lot, this will force back the herbage, resulting in a hard-wearing lawn. However, as the herbage does not completely disappear, you can easily change your mind at a later date. While conventional green roofs with lawns require a lot of water, the “summer plains” system requires a reduced supply of water due to the plants selected and the sophisticated technology used for the system. It also only requires a thin substrate layer of about 8 cm plus 2 cm of the “summer plains” roll-out lawn. The reason is simple: at the heart of the system is the new drainage and water retention element, Aquatec® AT 45, in combination with a WM 40 wicking mat. The basic principle involves the provision and distribution of water to the Aquatec® elements. The water is drawn upwards through wicks incorporated into the wicking mat and is available to the substrate directly in the root area. The provision of water for the Aquatec® elements is regulated through precipitation or, if there is a lack of precipitation, through the drip lines clipped into these elements. These are connected to a control technology, ensuring that the supply of water is regulated as required. Compared with conventional additional irrigation from above, for example using a lawn sprinkler, water consumption is reduced considerably as the water is available directly in the root area and none of it evaporates at the surface. And, compared with other common drip irrigation systems, significantly fewer drip lines are required as the water is distributed across the area of the Aquatec® elements. With conventional drip irrigation, the drip line intervals in the roof substrates had to be very narrow and still water was lost downwards. Our innovative Aquatec® “water distribution element” ensures that no water is lost, even at intervals of 50 cm between the drip lines. In addition, it is no longer necessary to fill the drainage elements, as is the case with other systems. This saves on weight, time and therefore costs. The ZinCo system build up “summer plains” can be used on flat roofs (also 0° roofs), on sloped roofs (up to about 5°) and also on inverted roofs. Versatile and low-maintenance: the client can only benefit thanks to the sophisticated system technology of “summer plains”, the simple intensive green roof.